The tragedy in Humboldt, Saskatchewan on April 6th left Canada reeling. The loss is unfathomable, especially in such a tight-knight community like sports. 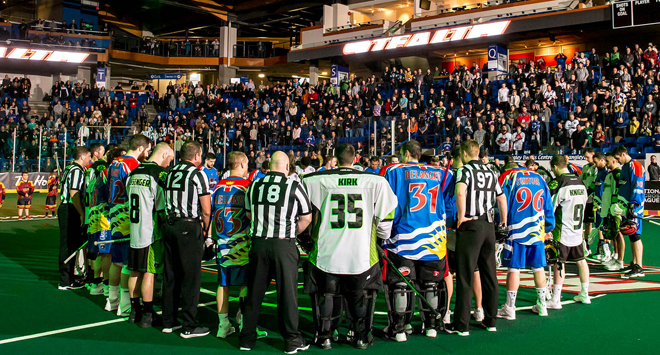 But where there is tragedy, there can also be hope, and the National Lacrosse League offered that up in spades this weekend as they paid tribute to the victims and survivors of the crash. In nine days, the GoFundMe page for the Broncos had raised over 11.6 million dollars. The NLL will be contributing thousands more through 50/50 sales and jersey auctions. The Saskatchewan Rush were hit the hardest hit NLL team by the loss. The team worked overtime to put together a full tribute game for the Broncos. Last week the team wore Humboldt Broncos helmet stickers and held a touching pre-game ceremony to honour the victims. This week, their efforts increased, and it was an effort appreciated by all as the province tries to heal. Fans in most (all?) 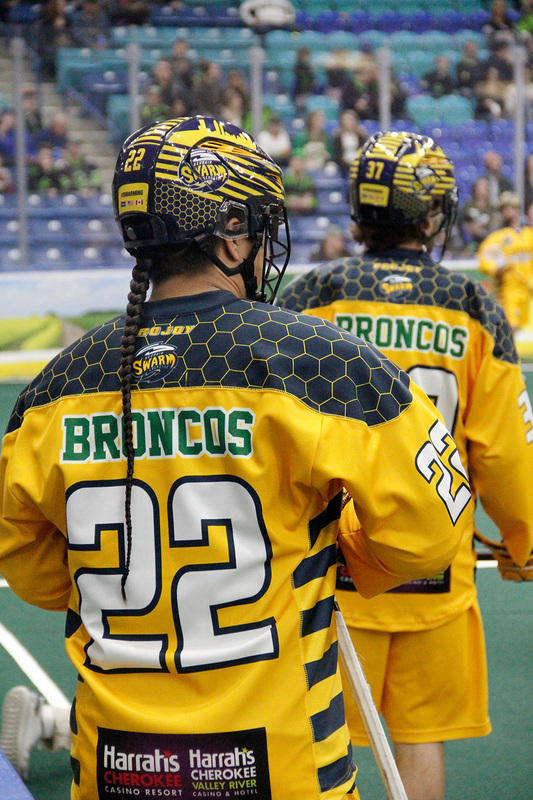 NLL arenas typically boo when the opposition hits the floor, but on Saturday, the Rush fans cheered the Georgia Swarm, who took the floor in special jerseys featuring “Broncos” on their backs in place of the usual name bar. The Rush wore green jerseys with “Humboldt” in place of the name bar, and both sets of jerseys are being auctioned here. The Vancouver Stealth also auctioned their annual BC themed jerseys and donated the $14,000 raised to the Broncos. The advertising on the rink boards at SaskTel Centre was replaced with the names of the 29 members of the team involved in the crash. Five first responders from the scene were honoured prior to the game as the Rush’s Heroes of the Game. The Rush held a ticket blitz a few hours prior to the game, with proceeds from the last 303 tickets available being donated. Around the league, teams paid tribute in pre-game ceremonies. Toronto held a moment of silence. The New England Black Wolves coaches wore green ribbons. Many business staffs wore jerseys on April 12th. Calgary and Buffalo, and Vancouver and Saskatchewan came together in a circle at centre floor for the national anthems during their games this weekend. Players around the league offered their condolences via social media. Several teams wore helmet decals. The Rush and the Calgary Roughnecks donated their 50/50 prizes to the Broncos. The Roughnecks set a new franchise record with $50,825 being donated. The Rush topped that with $84,980 being donated.